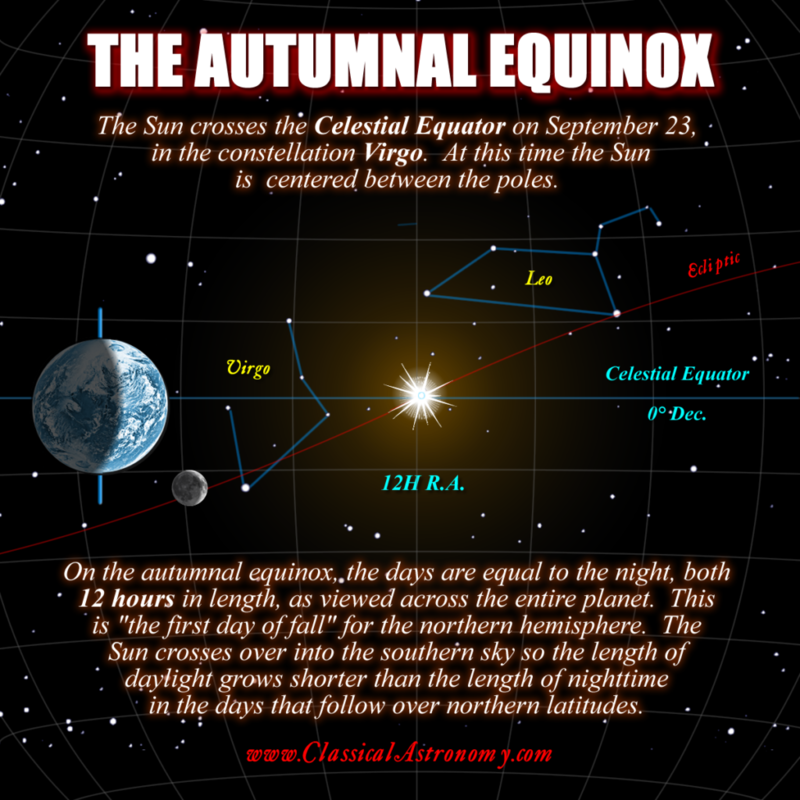 FALL BEGINS at 1:54 UT on September 23, which is 9:54 PM EDT on September 22. At this moment the Sun is centered over the celestial equator. The Sun’s rays graze the North and South poles, and everywhere in between experiences equal 12 periods of daylight and nighttime. This is thus the first day of fall for the northern hemisphere, since the days are henceforth shorter and the nights are longer. Also, on the equinox, the Sun rises due east and sets due west, the only time when the Sun is so aligned. Seems there is always someone who wants to quibble about the “equal 12 hour” point since there are periods of twilight before sunrise and after sunset. It has been understood since ancient times that twilight belongs to the night since the Sun is below the horizon. There are other minor factors including refraction and horizon dip that elevate the Sun above true horizontal and thereby rob a few minutes from the night. But those factors have also been understood since antiquity, and it’s always been known that “12 equal hours” is just an approximation. Nevertheless, for all history, the equinoxes have traditionally been regarded as the days that are “equal” with the nights, hence the name.